Whether you’re a first-time hearing aid user, or have been wearing hearing aids for years, considering the batteries of your devices is an important step when it comes to choosing a new hearing aid. Batteries are the one ongoing expense for hearing aid users, so it’s important to know your battery options, and choose the device that will work best for you. You don’t want to waste time fiddling with tiny batteries, prying open battery doors, or running out of power during an important meeting at work, so find out all there is to know about batteries before you buy. The most common type of hearing aid batteries are small, disposable zinc batteries. These batteries are activated by air, so as long as the sticker on the battery stays in place, the battery remains inactive. Once the sticker is removed, the oxygen in the air will interact with the zinc in the battery, creating power for your device. Replacing the sticker won’t deactivate the battery, so be sure the sticker stays in place until you’re ready to put it into your hearing aid. If you’ve ever been confused about battery sizes, here’s the scoop. The different sizes represent the different power needs and size of each device, and they’re all color coded so you’ll easily find the right battery. 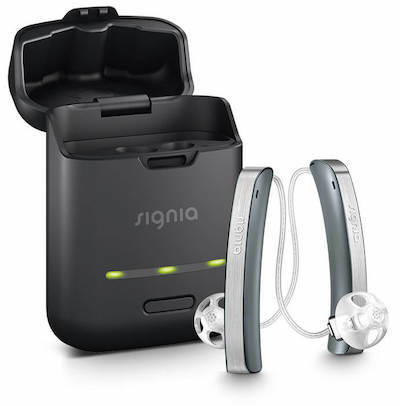 The more powerful the hearing aid, the bigger the battery needs to be in order to accommodate the extra power demands. Hearing aids that need more powerful batteries are used by people with severe hearing loss, or in hearing aids that have a lot of advanced programs and settings that require extra power. On average, batteries will last anywhere from 3 to 14 days, so it’s a good idea to always care spare batteries with you in case you suddenly run out of power. 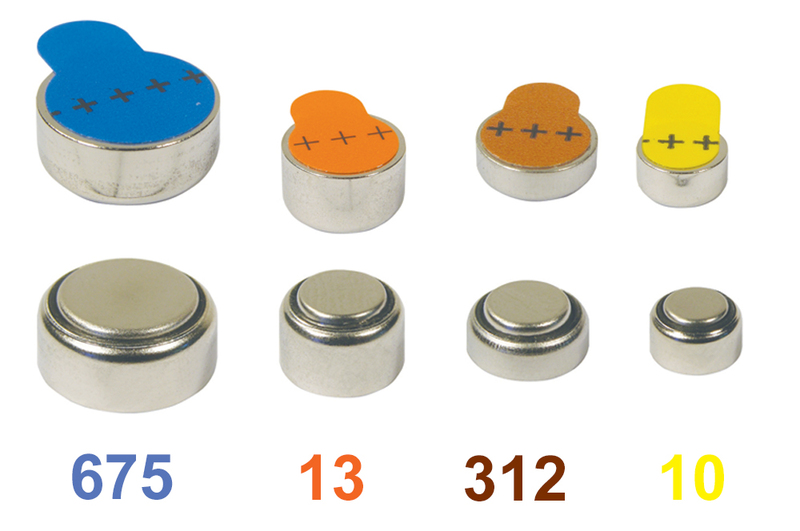 There are 4 sizes of hearing aid batteries, but compared to the batteries you put in your flashlight, they’re all very small. Even the largest battery is smaller than a dime. These batteries have a moderate battery life, and they’re the most common battery size. Both the Receiver in The Ear and In The Canal hearing aids use this size, and these batteries are identified by a brown label. Size 10 is one of the smallest hearing aid batteries on the market, measuring just 5.8mm by 3.6 mm. Size 10 batteries have a yellow label, and don’t have a very long life. They’re found in small hearing aids, like the Completely In the Canal models, and because of their small size, you’ll have to replace the batteries more often. Size 13 batteries have an orange label, and they’re right behind the 675 in terms of power output. They’re normally worn in In The Ear hearing aids. At Pacific Hearing Care, we have the latest hearing aid models that feature rechargeable hearing aid batteries! These designs completely change the way you’ll think about your devices. Rechargeable hearing aids have a built-in battery that can’t be removed. You can bid goodbye to running out of power, searching the house for the new batteries you’re sure you bought last week, and fiddling with tiny battery doors. We have a selection of hearing aids from the world’s top manufactures, designed for the ultimate in convenience. Rechargeable hearing aids are extremely easy to use. When you take your hearing aids out for the night, simply place them on the charger, and enjoy a good night’s sleep. When you wake up in the morning, they’ll be ready for another day of great hearing. Even if you stream a lot of audio or run complex programs, your devices won’t run out of charge, and most last over 24 hours on a single charge. You can also enjoy a quick charge feature, and by placing your devices in the charger for a couple of hours, you’ll gain 6 to 10 hours of clear hearing. To learn more about how rechargeable hearing aid batteries will change your hearing experience, visit us today at Pacific Hearing Care. Copyright Pacific Hearing Care. All rights reserved. Please use the form below to request an appointment and we contact you momentarily.